Mauro Icardi scored a late equaliser for Inter as the home side drew 1-1 with Barcelona at San Siro on Tuesday. Malcom's opener - and first for Barça - was not enough to secure all three points for Ernesto Valverde's side, who qualified for the knockout stages of the Champions League regardless. Barcelona started the game on top, with Inter struggling to deal with the Catalan side's high press. However, the first chance of the game fell to the Italian side in the 18th minute as a low cross into the box found Kwadwo Asamoah, who fired over under no pressure. This was to be the home side's only real chance of the first half as Barcelona forced saves from Samir Handanovic through Luis Suárez and Philippe Coutinho. However, both sides went into half-time goalless. The pattern of the game continued in the second half, as Barcelona dominated the ball without creating many clear-cut chances. In the 82nd minute, having come on as a substitute, Malcom picked up the ball on the edge of the box before driving a low finish beyond Handanovic, who perhaps should have done better with the effort. 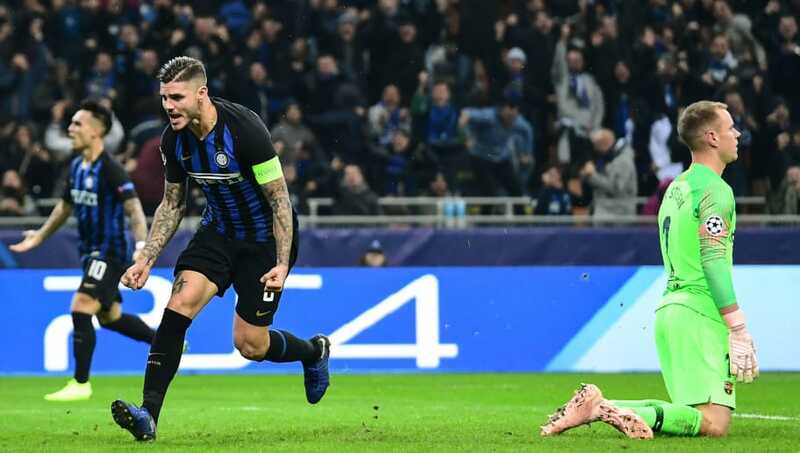 In the 86th minute, the home side scored a shock equaliser as a rebounded shot found its way into the path of Icardi, who fought off the attentions of the Barcelona defence before slotting a low shot beyond Marc-André ter Stegen to make it 1-1. Here's out breakdown of this one. Having won their last five home matches in all competitions, Inter seemed to have been making a fortress of San Siro prior to this Champions League clash. However, Barcelona coming to town represented a huge threat to their stronghold. San Siro rocking as Icardi brings Inter level. After beating Genoa 5-0 in their last home match, Inter were surprisingly toothless in attack against Barcelona on Tuesday night. Their passing was often wayward and their build-up play lacked pace and creativity. However, the Italian side showed their resolve and rescued a draw from the jaws of defeat, stretching their unbeaten run at home to six matches. STAR MAN: Such was Inter's rather underwhelming performance, Samir Handanovic was their star player on the night. The Slovenian goalkeeper was peppered with shots throughout the game and dealt with them with ease at times. With the likes of Suárez and Coutinho often allowed to shoot at will, Inter's goalkeeper had to be on top form to keep his side in the game and he was up to the task. WORST PLAYER: None of Inter's players were obviously the worst player, but there wasn't a single outfield player who shone either. Such are the capabilities of Ivan Perisic, he was perhaps the most disappointing of Inter's players on the night. The Croatian winger was electric at the World Cup but from his performance on Tuesday night he was unable to provide the spark to his side's attack. Inter's star man, Maurco Icardi, was quiet throughout aside from his late goal and it was the lack of service from the likes of Perisic that left the Argentine isolated. Despite rumours that Lionel Messi had recovered in time for Barcelona's Champions League Clash with Inter Milan, the Argentine was left out of the squad. Therefore, the question was how Barcelona's team would react without their talisman. While Barça probed throughout, they struggled to engineer that final pass and finish to make their dominance count. You have to think that, if Messi had been playing on the night, Barcelona may well have won this game comfortably. STAR MAN: On his return to San Siro, Philippe Coutinho stole the show for Barcelona. The Brazilian maestro oozed confidence on the ball, either choosing to pop off a quick pass or take his man on. With Barcelona's magician, Messi, missing the match through injury, it was clear that Coutinho took the creative burden onto his shoulders and the former Liverpool man dealt with it seamlessly. He was at the heart of everything good about Barcelona tonight and seems to have got even better since his Liverpool days. WORST PLAYER: Ousmane Dembélé has endured a tough time at Barcelona since his big-money transfer from Borussia Dortmund two summers ago. The French winger's long-term injury meant he missed the vast majority of the season, which complicated his transition into the team. Malcom with first UCL goal. Ousmane Dembele with another garbage performance. Against Inter Milan, Dembélé was poor in truth. He often seemed to inhibit Barcelona's attack rather than contribute towards it. Luis Suárez grew particularly impatient with the Frenchman throughout the game and was often seen directing him. It was a night to forget for the £135m man. Whatever happens on, er, Matchday 5, Liverpool will qualify if they beat Napoli by more than one goal at home (easier said than done) and Spurs will, most likely, need to win in Barcelona (easier done than it sounds, because they've qualified). In the Champions League, Inter next face a trip to Wembley as they face Tottenham Hotspur on 28 November. The Italian side won the reverse fixture 2-1, thanks to a last minute winner and, so long as they avoid defeat this time around, should qualify from the group. Barcelona, meanwhile, take on PSV away from home on the same date, safe in the knowledge that their progression to the last 16 is already assured.